Those who have been to Val d'Isere, know that it is a true legend. This small village, lost in the valley, is one of the finest skiing resorts in the world. 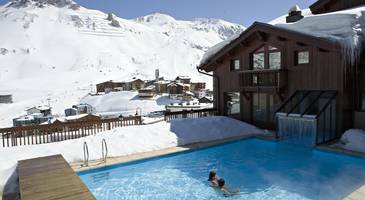 Val d'Isere has a long history of welcoming British visitors, who make up around 30% of current guests, so has very good Anglo services. It's also a very glamorous place, so it can be expensive, but everyone is welcome and all budgets are catered for. In the resort of Val d'Isere we have chosen for you the hotel Alpina Lodge with fully equipped and comfortable apartments in wood.